Born in Perth, John Austin Gloag became an active citizen in Dundee. Well educated and informed, he was one of the best known and most popular members of local society. He was also an enthusiastic supporter of the Albert Institute. Subscriber 259 – Alexander Clayhills – John Austin Gloag acted as agent, factor, trustee and beneficiary of Alexander Clayhills . 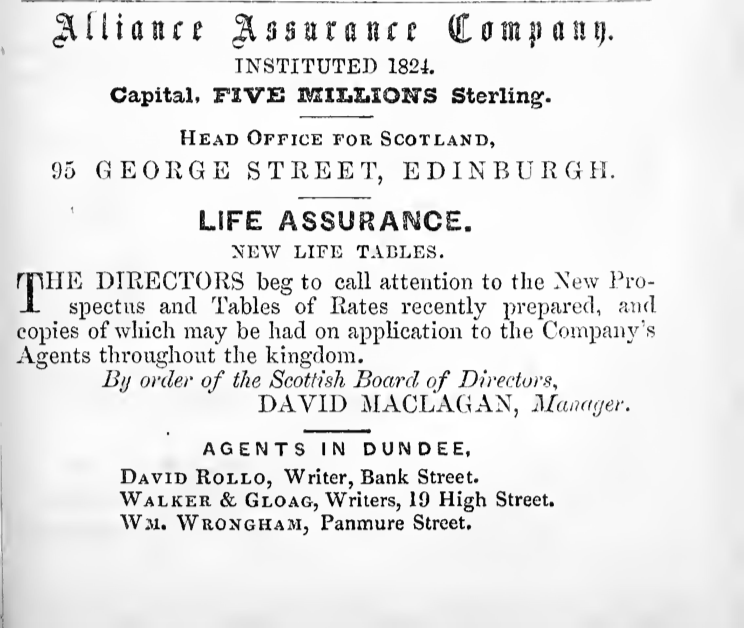 John Austin Gloag's career association with Dundee spanned the years 1849-1866. On the death of Charles Walker Snr., writer in Dundee, in June 1849, John Austin Gloag entered into partnership the following month with his son, also Charles, to form the firm of 'Walker & Gloag.' 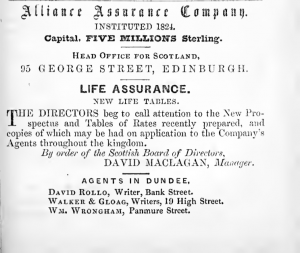 The firm was listed in the Dundee Directory of 1850 as writers and agents for the 'Alliance, Colonial and Insurance Co. of Scotland,' operating from 19 High Street, Dundee. The census record of 1851 listed Gloag as having been a 'solicitor,' at both Perth and also Dundee. Thereafter, it would appear that Gloag's base as a writer lay solely within Dundee, where he was well known in legal and social circles. He also held connections with the surrounding district, being as he was, agent and factor for the Invergowrie estates, under Mr Clayhills and, subsequently, Captain Clayhills Henderson. This was a position which had been held by his predecessor, Charles Walker, Snr. It would appear, that by 1861, John A Gloag forged a business on his own account, his erstwhile partner, Charles Walker Jnr. having departed (no indications of his disappearance have been uncovered). John Austin Gloag, by now operating from 18 Meadowside, remained in Dundee until he married in 1866, whereupon he moved to Edinburgh. There, he continued to practise law as Writer to the Signet and Procurator. John Austin Gloag was born to William Gloag, banker in Perth and Janet Burn in 1819. He was described as having been well educated and began his working life as a ‘writer’ in Perth. In his mid twenties, John Gloag was listed as both ‘writer’ and ‘stockbroker,’ located at County Buildings and also at 28 George Street, Perth, all the while living in the family home at 21 Marshall Place, Perth. John Austin Gloag’s arrival in Dundee around 1849 witnessed his establishment of the firm ‘Walker & Gloag,’ along with Charles Walker the son of Charles Walker, a writer at 19 High Street, Dundee whose death occurred in the previous month. John Gloag’s interests and talents took various forms. For a few months in 1851, he was requested to write the editorial articles for the ‘Dundee Advertiser.’ This was a role he relinquished later the same year, although he continued to contribute to the paper’s literary columns. His contributions were referred to as ‘readable and felicitous.’ He also published a number of books. By 1861, the firm of ‘Walker & Gloag’ was no more, although the fate of Charles Walker Jnr remains unclear. John Austin Gloag continued in business on his own account, having relocated to 18 Meadowside. An enthusiastic supporter of the founding of the Albert Institute, it was reported that John Austin Gloag felt that the stability of the enterprise would largely depend on the formation of the subscribers into a Limited Company. John Gloag was also credited with having taken a leading role in the establishment of the ‘Eastern Club’ in Dundee. At the mature age of 47 years, John Austin Gloag married the Honourable Elizabeth Georgiana Lake in 1866 at Damside, Perthshire, after which, the Gloags removed to Edinburgh, making their home at 10 Inverleith Place. Old Parish Registers. Perth. (1819). 387/ 30 0. ScotlandsPeople website. Manchester Courier & Lancashire General Advertiser. 9 August 1866. p.4. British Newspaper Archive website. Bedfordshire Times & Independent. 11 August 1866. p.8. British Newspaper Archive website. Census Records. Dundee. (1851). 387/ 46/ 6. ScotlandsPeople website. Scottish Post Office Directory, Perth, 1848-49. p.40. National Library of Scotland website. Census Records. Perth. (1861). 387/1 26/9. ScotlandsPeople website. Dundee Directory, 1850. p.106. Dundee Central Library, Local Studies. Dundee Directory, 1864-65. p.127. Dundee Central Library, Local Studies. Valuation Rolls. Dundee. (1865). VR009800015-/132. ScotlandsPeople website. Statutory Registers. Edinburgh. Deaths. (1883). 685/1 42. ScotlandsPeople website. Memorial No 135770284. Find a Grave website. Obituary. Dundee Year Book. 1881-1885. p.120. Dundee Central Library, Local Studies. Dundee Courier. 29 January 1874. British Newspaper Archive website. Dundee People's Journal. 16 July 1859. p.3. British Newspaper Archive website. Dundee People's Journal. 9 July 1859. p.3. British Newspaper Archive website. Dundee, Perth & Cupar Advertiser. 10 July 1863. p.5. British Newspaper Archive website. Dundee Directory, 1861-62. p.147. Dundee Central Library, Local Studies. Dundee Directory, 1864-65. p.241. Dundee Central Library, Local Studies. Dundee Directory, 1853-54. p.225. Dundee Central Library, Local Studies. Dundee Directory, 1858-59. p.134. Dundee Central Library, Local Studies. Legal Records. Wills and Testaments. Dundee Sheriff Court. (1849). SC45/ 31/ 9. ScotlandsPeople website. Dundee, Perth & Cupar Advertiser. 13 July 1849. p.3. British Newspaper Archive website. Dundee Directory, 1850. p.169. Dundee Central Library, Local Studies. Dundee Advertiser. 12 January 1883. p.5. British Newspaper Archive website. The information above about John Austin Gloag has been collated from a range of digital and hard copy sources. To the best of our knowledge it is correct but if you are relying on any information from our website for the purpose of your own research we would advise you to follow up the sources to your own satisfaction. If you are aware of an inaccuracy in our text please do not hesitate to notify us through our Contact page.